The internet's most famous "Teen Mom" isn't on MTV—she's on live stream from the Animal Adventure Park in Harpursville, New York. Or at least she was, until very recently. More on that in a second, though. Indeed, April the Giraffe didn't achieve fame until she was nearly 15, in February 2017. That was when owners of the park decided to live stream April, then pregnant with her fourth calf, the birth of whom became a viral phenomenon, with more than a million viewers around the world tuning it. If you weren't one of them, there's good news and bad news. The good news is that all of April's most adorable moments are now archived on her official YouTube channel, which means that you can enjoy them whenever you want, forever and ever. The bad news? April's live stream has ended (some websites report this is due to an injury, but in fact the park never intended the live stream to be permanent), which means that you won't be able to enjoy any new videos of April doing cute giraffe-mom things. Unless, of course, you go to visit her in person. The first step in visiting April is to get to Animal Adventure Park, which is located in Harpursville, New York, about 15 minutes down I-88 from Binghamton, and about two hours from the New York state capital, Albany. If you're coming from outside of New York, your best bet is to fly either here or to New York City, then rent a car and make the drive to Harpursville. Currently, public buses do not run all the way to Harpursville, only to Binghamton. No matter how you plan to visit Animal Adventure Park, don't go booking your tickets just yet. Animal Adventure Park doesn't open for the year until May 13, so if you show up before then you'll be disappointed. Ironically, attempting to visit April the Giraffe during the month of April is not a very good idea! The $12.99 adult admission fee (for seniors it's $11.99, while kids from 3-11 cost $10.99) includes access to all of the animals in Animal Adventure Park, which include not only giraffes but camels, monkeys and birds. 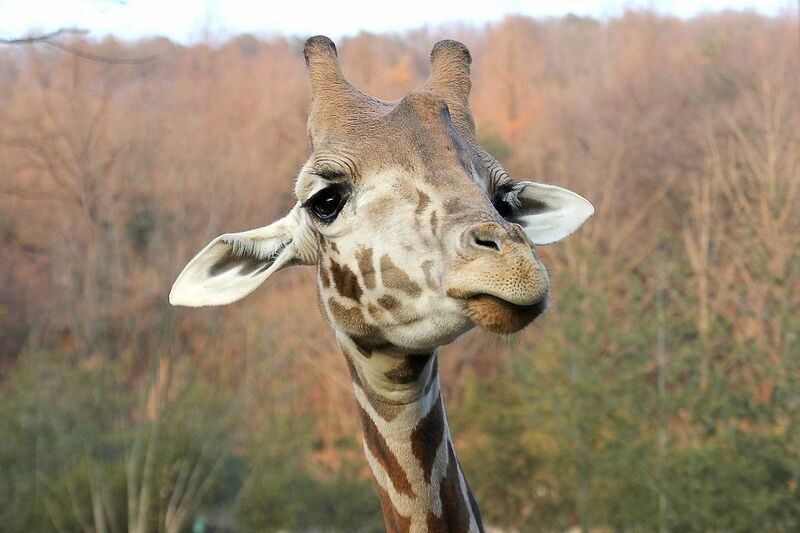 To maximize your chances of interacting with April (and other giraffes), however, you might time your visit to coincidence with one of the park's upcoming giraffe-related events. The first of these is a BBQ celebrating both Father's Day and World Giraffe Day, on June 18. Park staff will be presenting April and her new calf Oliver with a "special treat" on this day at noon, so you are guaranteed to see April in the flesh if you visit Animal Adventure Park on World Giraffe Day, to say nothing of the delicious food you'll enjoy. Another option would be to attend Drafts With Giraffes, which takes place on June 24. This event occurs after park closing hours, from 5-8 p.m., and requires the purchase of a supplementary $35 ticket for each drinking adult—designated drivers are $15. More than 40 draft beers will be on offer, although April herself will not be sampling any of them, as "Drafts With Giraffes" is just a catchy name, not a slogan meant to encourage animal alcoholism. Can You Actually Meet April? Drafts With Giraffes apparently presents the opportunity to "kiss a giraffe,"although it's unclear whether the giraffe in question is April, one of her calfs or someone else entirely. As the park's star giraffe, however, April would do well to attend such a high-profile event, even if she isn't giving out kisses to anyone who asks for one. You will definitely see April if you visit Animal Adventure Park, likely from a very close distance, certainly one near enough to get amazing photos (as if she doesn't have enough Instagram popularity already!). If April took time to meet all the million-plus people who watched her give birth, however, she wouldn't have time to nurse her new calf, so make sure not to take it personally if you can't enjoy an individual visit with April on your trip to Animal Adventure Park.